Viewing topic "Motif ES All Voice file .W7V to XF?" 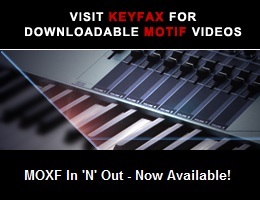 - Yamaha’s Motif XS Editor could read XS Editor files & I believe can make XS All Voice files. An ES .W7V “All Voice” file can be directly loaded to an XF - no conversion is required. Due to differences in the ROM Waveforms and Effects, the Voices may not sound the same as they do on an ES. See Data Compatibility with the MOTIF ES6/MOTIF ES7/MOTIF ES8 on pages 236-237 of the XF Reference Manual for details. Once the ES file is loaded, an XF file can be saved if that’s the goal. Well, that was easy. Thank you. You’re welcome. I aim for easy, although sometimes getting the job done requires a bit more effort.